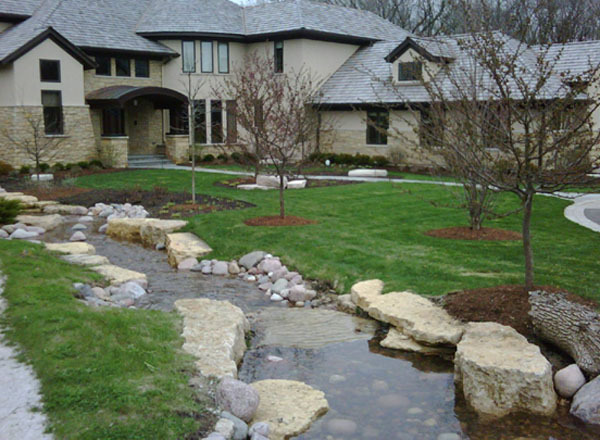 Nothing looks better than a natural looking stream bed or creek. This creek bed runs through the front of the yard and is now the focal point of the landscape. When talking to your pond building expert be sure he understands how to construct a stream. It is nice if there is a natural slope in the yard to aid the the flow of water. It is recommended to have a filter box or powerfall at the start of the stream bed to help filter. Also a skimmer at the end to pick up the water is a good idea. It will help to remove leaves and other debris that always makes it’s way into this low lying body of water. The water depth is usually shallow so it is important to have a good flow and keep it clean so you do not get to much algae. Be sure to use a pond contractor that you trust and will take the time to answer you questions to make sure your water feature is just what you are dreaming of.